I've started a new project over the past few weeks creating an electronic phenakistoscope. This is actually a project I started many years ago and failed, so I'm giving it another go. I will have a few videos on my YouTube channel once I get this completed. What I am building will use a spinning disk with a series of frames of an animation spaced around it. Rather than looking through slots to isolate the images, I am taking more of a high tech approach. As the disk turns, an LED will flash at one of spot of the disk as it spins by, accurately timed. I've seen different takes on this over the years, and I've wanted to give it a try. The image I am using is a lithograph print I pulled from a litho stone. This image was from my first attempt at this project. I was trying to avoid complicated electronics since at the time I had very limited experience with microcontrollers, so I was using LEDs and micro switches to set the timing. It worked, but not elegantly. I will be using the same image of falling anchors for this project. The first thing I did was figure out how I wanted this thing to look. So I sketched up a few ideas and this is what I came up with. Basically a spinning disk mounted on a shaft. further down the shaft will be a pulley that runs over to a crank. There is also an encoder disk and optical sensor. So as this shaft spins, I will be able to calculate the speed, and time the lights based on that. This is a rendering of the finished design. I wanted to minimize the amount of hardware and electronics that were visible from the front, so when it hangs on the wall, it is a clean presentation. Once I had my design finalized, I sent off the parts to be laser cut. The company that I use for laser cutting (Outfab.com) charges a flat rate by size. So 6"x12" is the smallest they charge for, so I made sure to fit all my pieces in that envelope. It takes about 5-days to get back the finished pieces from them. 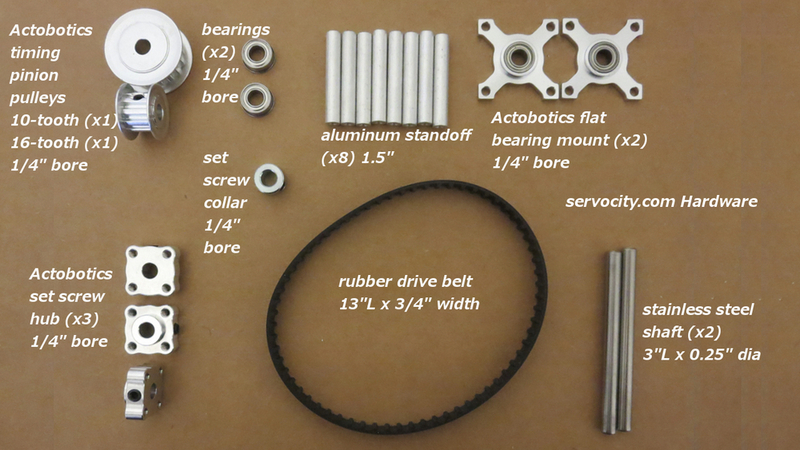 While I was waiting for the laser cut parts, I went ahead and ordered all of my hardware. I had some of the parts on-hand, but I decided to just order everything new, and then I would be able to keep my little stash of hardware stocked up. So I navigated over to Servocity.com . There are a lot of on-line/offline places to buy hardware for robotics and this sort of project, but they make it so easy. They have really clear descriptions and a lot of the time they have 3D files to download of the parts (Not sponsored or anything, just a great site).